What Happens During Endodontic Treatment? What is a Root Canal? A local anesthetic will be given. A sheet of latex called the "rubber dam" (we've got nonlatex ones too) will be placed around the tooth to isolate it, hence keeping it clean and dry during treatment. The treatment consists of four basic steps, but the number of visits will depend on your particular case. 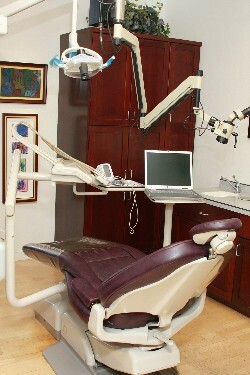 Most treatments are completed in one visit, although occasionally consecutive appointments are needed. Let's look at the basic steps for nonsurgical endodontic therapy. Step 2: The pulp is removed from the pulp chamber and root canals. Tiny instruments called files are used to clean the canals and shape them to a form that will ensure they will be well sealed. Step 3: The root canals are filled and sealed with a material that prevents bacteria from re-entering. Radiographs (x-rays) are taken prior and post-treatment. step 4: The opening in the tooth will be filled with either a temporary or permanent filling during your treatment visit, depending on your restoration plan. it is important to return promptly to your general dentist if a temporary is placed. A temporary filling can loosen and/or leak which can compromise the root canal treatment, causing it to fail and therefore needing re-treatment. The pulp, or soft inner tissue of your tooth, is normally surrounded and protected by a layer of dentin. The dentin is protected by a layer of enamel above the gumline and is covered by cementum below the gumline. 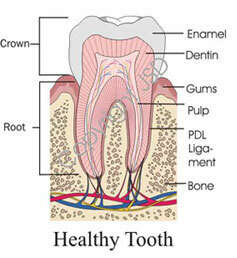 When a deep cavity, decay or crack destroys these protective layers, the pulp is exposed to the bacteria in your mouth. This can result in infection, inflammation and eventually necrosis (pulp death). A severe blow to the tooth can also damage the pulp. Irritants may then escape from the end of the root and cause a diseased area (apical lesion) in the bone. Root canal treatment removes the damaged pulp and irritants. This allows the bone surrounding the root end to repair and heal. Will I experience discomfort following my appointment? Most patients experience a little soreness after treatment.. Over-the-counter analgesics like ibuprofen, aspirin, or acetaminophen usually relieve the discomfort. If severe pain or swelling occur you should call as you may need an antibiotic. Generally people return to work or continue with their daily plans. Apicoectomy is an endodontic surgery procedure which involves removing the tip of the root and sealing the root canal. 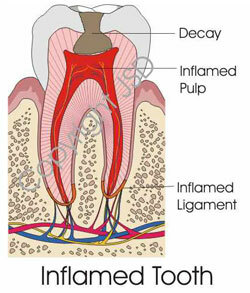 The purpose is to fight an infection in the tissues surrounding the tip of the root and save the tooth from extraction. An apicoectomy is usually only performed after a root canal has failed. The majority of these cases are caused by problems near the tip (apex) of the root. During an apicoectomy an incision is made in the gum tissue so that the root is accessible. The edge of the root tip up to the problem area is removed, along with any infected surrounding tissues. If needed, the final 3-4 mm of the root canal are cleaned and filled with a biocompatible material called a retrofill. Apicoectomy success rate is high if performed by a skilled endodontist, but as in all surgery procedures there are always risk of complications and failure.